The scene of a rubbish fire in an alleyway. Nottinghamshire Fire and Rescue say they believe that a fire this morning (January 24) was started deliberately. One crew from Mansfield were called at 5.20am this morning to attend the scene of a rubbish fire in an alleyway. A spokesman for Notts Fire and Rescue said: "One hose reel was used to extinguish the fire. Firefighters had left the scene by 5.37am. "No one was injured but there was approximately 6-10 square metres of fire damage. "The fire is believed to have been set deliberately." 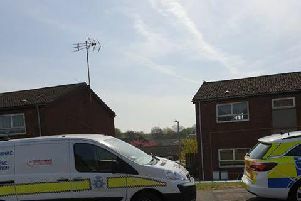 A resident of Moor Street near the scene of the fire said: "I was asleep and my son was just leaving for work, and he shouted that the alley was on fire. Janice and Michael Melbourne who are supported by fellow Victoria Street resident, Glenn Booth, right, and George Jabbour, left, the Conservative Mayoral candidate. "I saw smoke billowing so I called 999. "We've had lots of trouble round here and nothing is being done about it. "My car window was put through, I've had CCTV installed and my security gate was broken." Janice Melbourne, aged 75, has lived on Victoria Street for more than 30 years. Janice was woken up this morning by the sound of the fire, which she said sounded like an engine running. She added: "I was in bed and I heard a noise that sounded like an engine running. "I saw flashing lights which was the fire brigade putting the fire out. "I said to my husband Michael that we had better get dressed in case we had to leave. "It makes me feel unsafe, I don't know what's going to happen next. "I hope it stops and the council shifts the rubbish now, it's horrendous." Residents have previously said how angry they feel over fly-tipping in the alleyway, after Mansfield District Council told them they must foot the bill to clear the mess.